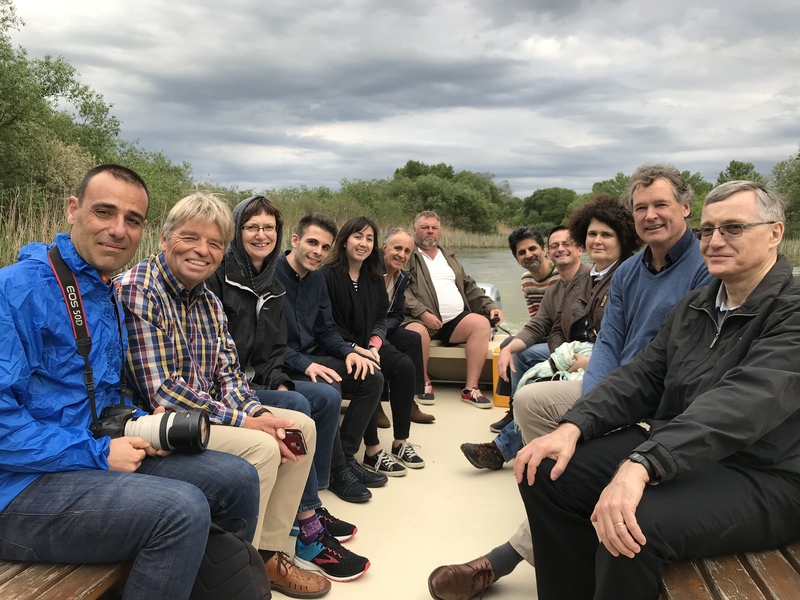 Boat trip on Lake Tisza, Hungary during the final workshop – and imminent thunderstorm. IMPRESSIONS (Impacts and risks from high-end scenarios: Strategies for innovative solutions) is a 5-year EU project that seeks to better understand the impact of high-end climate change – above 2°C – in Europe. As a global temperature increase of above 2°C looks increasingly likely, ‘high-end’ climate change impacts become alarmingly plausible. A set of four integrated climate change and socio-economic scenarios are applied across a number of case studies. These are at different scales: national (Scotland); transnational (the Tagus river basin, Iberia); regional (the towns of Veszprem and Szekszard in Hungary); international (Europe as a whole); and outside the EU (Central Asia: Kazakhstan, Turkmenistan, Uzbekistan, Tajikistan and Kyrgyzstan). The Central Asia study considers the implications for Europe of high levels of climate and socio-economic change outside the EU. Over the last four years stakeholders in the Scottish case study, including decision makers from national and local government, public bodies and private businesses have participated in three workshops, held at the Edinburgh Centre for Carbon Innovation and Stirling University. In the workshops we developed the four integrated climate and socio-economic scenarios for Scotland. These scenarios were refined and further developed by project researchers and modellers. We then developed pathways, integrating climate change adaptation and mitigation, towards a vision underpinned by the UN Sustainable Development Goals. Each case study developed four integrated scenarios characterised by moderately high (+0.9 to +2.2°C) or extremely high (+1.7 to +3.8°C) climate change, and by different levels of socio-economic equality. The Scottish scenarios provided the most imaginative names – MacTopia, Tartan Spring, Techadonia and Mad Max. The integrated scenarios provide a means to capture the uncertainties and variability that characterise high-end climate change futures. It is hoped that bringing together decision makers and researchers to examine complex and uncertain issues will help in making long term plans that encompass a knowledge of climate risks and the limits of adaptation. The various scenarios enable stress testing of potential solutions and ‘pathways’. This should help us to identify policies that can drive innovation, especially through achieving synergies between adaptation and mitigation, and multiple benefits across sectors. The final workshop was held in Tiszafured, Hungary this April. It brought together stakeholders from all five case studies and the project team of researchers and facilitators, around 60 people in all. 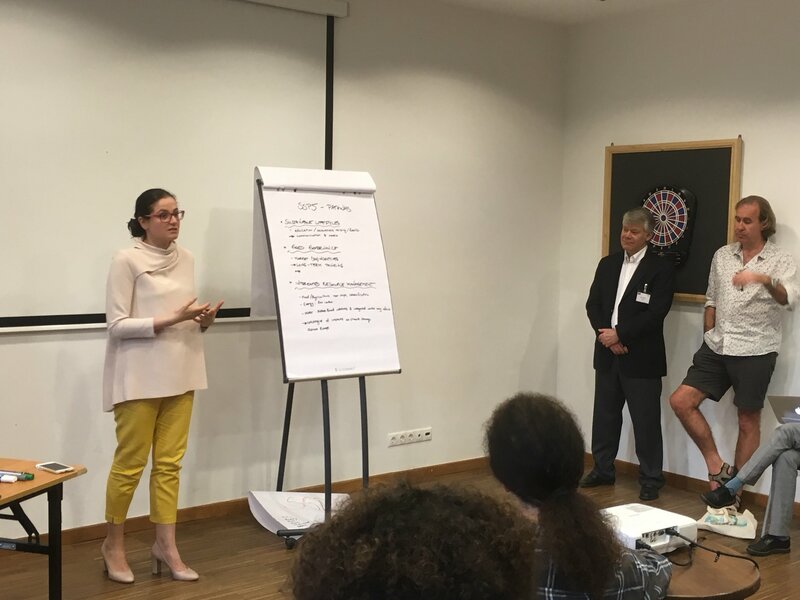 The Hungarian workshop provided an opportunity for discussion between researchers, modellers and climate scientists, and stakeholders across various backgrounds, bringing a range of local concerns. The days included a mix of plenary discussions and group workshops where we developed work within individual scenarios or case studies, or worked on specific policy suggestions, such as reform of the Common Agricultural Policy. We investigated interactions between sectors and regions, and positive and negative tipping points. We also considered the potential impacts of shocks or ‘game-changers’ – a total global collapse of the internet, or a major volcanic eruption. By contrast the evenings provided some related but lighter investigations. 2100 – A vintage year for Scottish wine? We heard insights into the potential for wine production in Scotland in 2100 through the investigation of ‘climate analogues’ comparing the projected 2100 climate for areas such as Innerleithen, Fife and Orkney to current wine-growing areas in France, Germany and Hungary. Although the analogues using annual average temperatures initially looked promising, we found this was potentially misleading because Scotland experiences relatively mild winters for its latitude. Looking at average summer temperatures was less promising, although the longer day length might have an effect. And Scotland’s soils are not generally suitable for wine growing. However, those inconvenient truths didn’t prevent us from enjoying sampling the wines from the analogue regions including the Loire Valley, Burgundy, and Eger in Hungary. 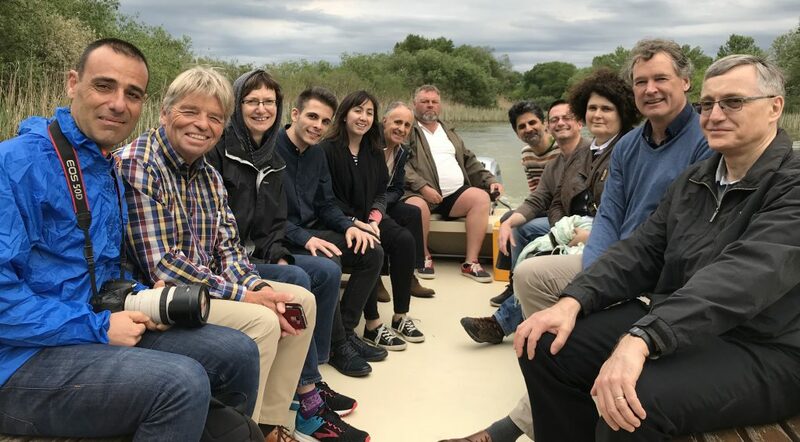 On a boat trip on Lake Tisza, despite the storm warning in place (our conversation with our boatman went: ‘What’s that flashing light?’ ‘It’s a storm warning for the boats’ ‘We’re in a boat’ ‘It’s only a Grade 1 warning!’ – to be fair the lake is only 1 to 2 metres deep) we learned it is Hungary’s largest artificial lake, created in 1973. The Tisza Dam provides flood control and powers the largest hydro-electric power station in Hungary, while the lake has created a new ecology and is an important recreational and tourism facility. We managed to outrun the storm, and the trip was followed by a tour of the local ecology museum and presentations from a systems ecologist and a local ‘farmer/geographer’, who described the repeated failure of ‘hard’ flood control in the river basin and the complex interaction of ecological, socio-economic and political factors at play in a situation where local communities and farmers are just trying to keep going. The local area provided a fascinating and compelling example of the need for integrated adaptive solutions that encompass research, policy and local practice. Ruth Monfries works at the Royal Botanic Garden Edinburgh with ClimateXChange, Scotland’s centre of expertise connecting climate change research and policy (www.climatexchange.org.uk). Learn more about the IMPRESSIONS on the project website: impressions-project.eu.